The American bulldog is a breed of domestic dog (Canis lupus familiaris). There are generally considered to be three types of American bulldog: the Bully or Classic type, the Standard or Performance type and the Hybrid type. They may also be called the Johnson type or the Scott type. These types are named after the breeders who were influential in developing them, John D. Johnson (Bully) and Alan Scott (Standard). American Bulldogs are thought to be descended from working type bulldogs found commonly on ranches and farms in the Southern and Midwestern parts of the United States. The American bulldog is a stocky, well built, strong-looking dog with very powerful jaws, a very large head, and a very muscular build. Its coat is short and generally smooth. The breed is a light to moderate shedder. Colors, while historically predominantly white with patches of red or brindle, have grown in recent years to include many color patterns: including red, brown, fawn and all shades of brindle. The color conformation is quite varied, but blue, tri-color, black and tan or any degree of merle is a breed undesirable and considered a fault or disqualification by most breed standards. Black pigmentation on the nose and eye rims is preferred, with only some pink allowed. Eye color is usually brown but split eyes (one blue and one brown) also occurs. American Bulldogs can be droolers; this varies and is more prevalent in the Bully type. This type is generally a larger, heavier dog with a shorter muzzle. Standard or Performance types are generally more athletic with longer muzzles and a more square head. It is important to note that many modern American Bulldogs are a combination of the two types usually termed "hybrid." In general, American Bulldogs weigh between 27 to 54 kg (60 to 120 lb) and are 52 to 70 cm (20 to 28 in) at the withers, but have been known to greatly exceed in that "out of standard", nonworking stock. An American bulldog with the classic white and brindle coat. Note the large heard and powerful jaws. American Bulldogs are typically confident, social and active dogs that are at ease with their families. They bond strongly with their owners. Young American Bulldogs may be slightly aloof with strangers but as they mature the breed's normal confidence should assert itself. This breed tolerates children and can do very well with them, provided they are socialized early and understand their limits. The more exposure to good training practices, other dogs and people, the more likely the success at being controlled both inside and outside of their environment. Early training and socialization both in the home and outside of the home is essential for this breed. One way to help accomplish this goal can be done in the simplest of ways, by walking them regularly at local parks. While its genetics and breeding were to produce a working farm utility dog that could catch and hold wild boar and cattle, kill vermin, and guard an owner's property, when properly trained, exercised and socialized, this breed can become a great family pet.Bulldogs are very protective of their owners. The tendency towards dog aggression is not uncommon in this breed especially as they reach social maturity at around 2 years of age. Purebred American Bulldogs are excellent tracking, obedience, working, guard and family dogs; being true, some American Bulldogs are not tolerant of unknown creatures or people on/near/approaching "their" property/area/vehicles and sometimes even not so familiar friends and family when owner is not present. Assertiveness (charging-rushing) towards other dogs even when outside of territory/property is not uncommon. American Bulldogs are known to be a very dominant breed, but should not be hostile on neutral territory (in other words, nowhere near their home). American Bulldogs generally do not engage unless seriously provoked. The breed is also noted for having an extremely high pain tolerance. Puppies have been noted for being friendly and carefree (1–8 months), such as no cares around strangers at home, and friendliness towards all animals (except ones fleeing from danger). Young adult American Bulldogs may display some aloofness towards strangers but they likely will not be cowardly or shy. Generally by 18 months or so the breed's natural confidence will likely assert itself - then maturing and developing into an alert, protective, smart and all-around companion. This breed's high prey drive can sometimes make them unsuitable for homes that have cats and smaller pets, but the correct socialization at an early age (see above, temperament) will greatly increase the chances of them accepting these animals. The characteristics of Heterochromia is not a positive genetic trait though benign. The history of Mastiff-type dogs in the British Isles predates the arrival of Caesar. With the arrival of the Normans in 1066 came Spanish Alaunts from the continent. The breeding of the indigenous mastiffs to the newly arrived ones produced the Mastiff and bulldog of England. An interesting side note is that all descriptions of the Spanish Alaunts (there were three types) mention an all white, or mostly white coat. In Spain and England during the 17th and 18th centuries, bulldogs were used on farms to catch and hold livestock, as butchers' dogs, as guardians, as well as for other tasks. Many settlers brought these dogs with them to help around the farm, hunt in the woods, guard property, and for gambling and sport. In 1835, the sport of bull-baiting was outlawed in Spain and the United Kingdom and, over time, the bulldog became a common pet, being bred into today's more compact and complacent version. The product was as much from the efforts of selectively bred bulldogs as it was the introduction of the pug. However, some strains of bulldog type dogs maintained their utilitarian purpose, and thus underwent fewer modifications, even as their popularity declined in favor of other breeds. Even the slight modifications the bulldog underwent in Spain and England up to the Industrial Revolution (before 1835), were absent in the working strains. Most settlers of the American South came from the West Midlands of England and emigrated as a result of the Civil War between Royalists and Parliamentarians, well before the Industrial Revolution). Bulldogs in Spain and England were originally working dogs who drove and caught cattle and guarded their masters' property. A female American bulldog puppy at 14 weeks. The original bulldog was preserved by working class immigrants who brought their working dogs with them to the American South. Small farmers and ranchers used this all-around working dog for many tasks including farm guardians, stock dogs and catch dog. These dogs were not an actual breed as considered by today's standards but were a generic bulldog type. There were no recorded pedigrees or records and breeding decisions were dependent on the best working farm dogs despite breed or background. Several separate strains of the "bulldog" type dogs were kept by ranchers as utilitarian working dogs. By the end of World War II, however, these bulldog type strains were becoming extinct. Mr. John D. Johnson, a returning war veteran, decided to resurrect this breed. He found many of the best specimens of these working type dogs and started recording pedigrees and family trees. His aim was to produce a large farm guardian-type bulldog, reminiscent of the bulldogs of old. Later Alan Scott and several other breeders joined Johnson's efforts to resurrect and recreate the old time bulldogs. Johnson and Scott began to carefully breed American bulldogs, keeping careful records and always with an eye for maintaining the breed's health and working abilities. Initially Johnson and Scott had a similar vision and even traded dogs with each other. However in time there was a split between their visions and resulted in the two distinct types of American Bulldog. Alan Scott preferred a smaller more athletic dog with a longer muzzle that could be used for cattle catching as well as wild boar hunting. John Johnson preferred a larger more massive dog with a shorter muzzle that was more of a guardian type dog. Over time the two founding breeders as well as important breeders crossed in other breeds to help meet their goal of the ideal working bulldog. Originally the breed was called the American Pit Bulldog and in the 1970s registered with the National Kennel Club (NKC) as such. 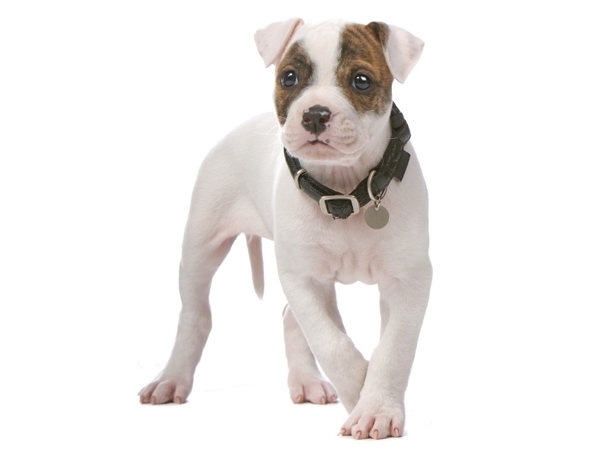 Later the name was changed to American Bulldog to avoid confusion with the American Pit Bull Terrier. The American bulldog was recognized by the United Kennel Club on January 1, 1999. Currently the breed is recognized by the NKC, UKC and the American Bulldog Association (ABA). Perhaps the most important role of the bulldog and the reason for its survival, and in fact why it thrived throughout the South, was because of the presence of feral pigs, introduced to the New World and without predators. The bulldogs were the settlers' only means of sufficiently dealing with the vermin. By World War II, the breed was near extinction until John D. Johnson and his father scoured the backroads of the South looking for the best specimens to revive the breed. During this time a young Alan Scott grew an interest in Mr. Johnson's dogs and began to work with him on the revitalization process. At some point, Alan Scott began infusing non-Johnson catch bulldogs from working southern farms with John D. Johnson's line creating the now Standard American Bulldog. At another point, Mr. Johnson began crossing his line with an atavistic English bulldog from the North that had maintained its genetic athletic vigor. This created a falling out between Johnson and Scott causing them to go their separate ways and breed the two significantly different versions of the American bulldog. Also, in the year 2010, the breed of American Bulldogs was awarded the best breed of the decade. American bulldogs are now safe from extinction and are enjoying a healthy increase in popularity, either as a working/protector dog or as a family pet. All over the world, they are used variously as "hog dogs" (catching escaped pigs or hunting razorbacks), as cattle drovers and as working or sport K-9s. American Bulldogs also successfully compete in several dog sports such as dog obedience, Schutzhund, French Ring, Mondio Ring, Iron Dog competition and weight pulling. They are also exhibited in conformation shows in the UKC, NKC, ABA and ABRA. Bulldogs generally live from 10–16 years, and tend to be strong, physically active, and often healthy. Some health problems in American bulldogs are often found within certain genetic lines, and are not common to the entire breed, while others, such as neuronal ceroid lipofuscinosis (NCL), Ichthyosis disorders of the kidney and thyroid, ACL tears, hip dysplasia, cherry eye, elbow dysplasia, entropion, ectropion, and bone cancer are more common to the general population of American Bulldogs. There are DNA tests available to help breeders screen breeding animals for NCL (neuronal ceroid lipofuscinosis and Ichthyosis. It is highly recommended to spend time to research your breeder information, including your American Bulldog's family history. A Penn Hip (Pennsylvania Hip Improvement project) or OFA (Orthopedic Foundation for Animals) screening is recommended for all potential breeding animals.